Procrastination can be a powerful tool. Sometimes I’m so busy procrastinating something I don’t want to be doing, that I get a ton of other tasks done in the meantime. And it is true, there is something about deadlines that makes our adrenaline rush and in the last minute frenzy, we work hard and fast, and often more efficiently than if we had all the time in the world. I remember many all nighters during college getting projects and papers finished before class the next morning. It was almost exciting! But of course, that was when I only had myself to worry about and I could manage and control the rest of my time (like coming home from classes and taking a long nap). Since I am suddenly reminiscing about my college days, I will try to explain this like a mathematical proof. Except, I think all the Non-Math people will be able to understand this as well. Procrastination Scenario ~~~~~~~~~ Let’s say every day for a week Suzy is supposed to accomplish three things, for a total of 21 important tasks in that week. These things must be done by Sunday for Suzy’s family life to function smoothly. On Monday, Suzy does two things and saves the third for Tuesday. On Tuesday, Suzy does Monday’s 3rd thing and one of Tuesday’s tasks. This pattern of only accomplishing two things each day continues. On Sunday morning, Suzy has completed 12 and has 9 to finish on the last day of the week. Suzy’s six-year old gets sick and her husband suddenly remembers that he invited company over for dinner. Suzy probably feels stressed, things get left undone, and family life does not function smoothly as hoped. Every day we put things off, we are just piling up and making tomorrow harder. When really, we just need to tell ourselves the truth today: “I will not feel like doing this tomorrow anymore than I feel like doing it today.” Procrastination robs tomorrow! There is no such thing as the perfect time to get organized or the perfect time to get healthy or the perfect time to start living the life you want. If we wait around for the perfect time, we will wait forever. We have to start designing the lives we want in the middle of the chaos, or we will never get out of the chaos! We have to stop procrastinating making the changes we need to make. Now is the time! Let’s stop lying to ourselves, leave our excuses at the door and just get ‘er done! 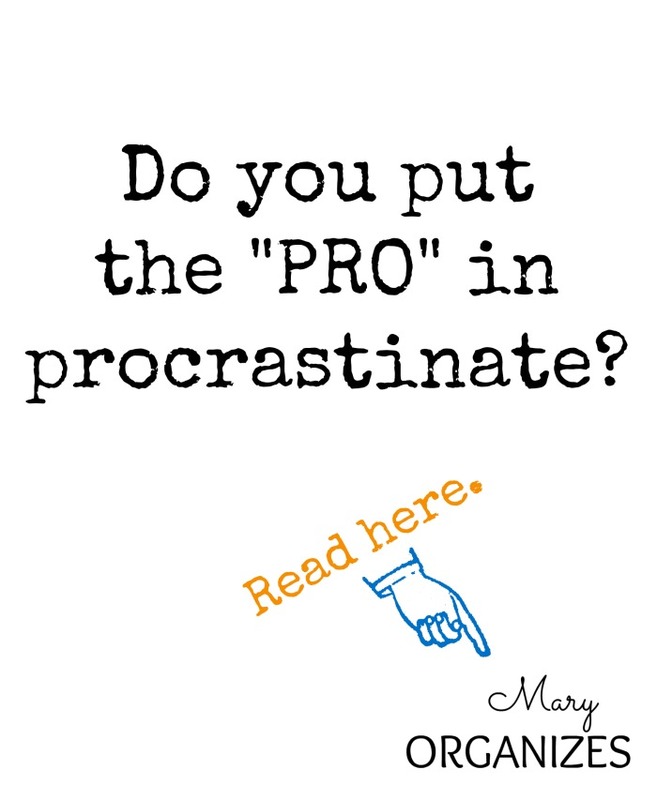 What have you procrastinated? What will you change? Me too! Definitely much happier! Thanks! I needed to hear this, this morning. Exactly, love the “if not now, when?”!! Wow, powerful and so true! I’m just like Mrs. ‘Stressed’ Suzy! I have to print this and remind myself daily…!!! I am printing this out so I can put it in my daily binder. Thanks I think if I keep reading this I will procrastinate less. That’s a tough one. Do you have a plan/ideal of when is the best time to do that? I think I need to print that equation out! I think I procrastinate because I think if I do it now, I won’t save time. The space will just fill up with more work I wouldn’t have to do if I was pressed to do the first chore. So it seems like I’ll actually have to do more if I do this now. I know what you mean. I think lots of people would agree with you. And maybe procrastinating is your way of telling yourself what is really important to do? What if you looked at your to do list and expectations for yourself and you created a simplified plan and trimmed some things out? This way you don’t have the drama of procrastination, but you aren’t overwhelming yourself with too much either.